Artist Leonid Tishkov demands his works be removed from the exhibition “Dreaming Russia – Works from the Gazprombank Collection” at the Albertina Museum in Vienna, protesting against the persecution of Greenpeace activists who staged an action at the Prirazlomnaya platform of the “Gazprom Neft Shelf” oil company. Below is Tishkov’s open letter to the Albertina Museum Director, originally published in Russian on colta.ru. Translated into English by Corina L. Apostol. In early October, the exhibition “Deaming Russia / Russian Contemporary Art from the Gazprombank collection” opens at the Albertina Museum in Vienna. The exhibition includes works from my photographic series “Private Moon” (2003/2005), one of which is even featured on the invitation to the exhibition opening on October 11th. 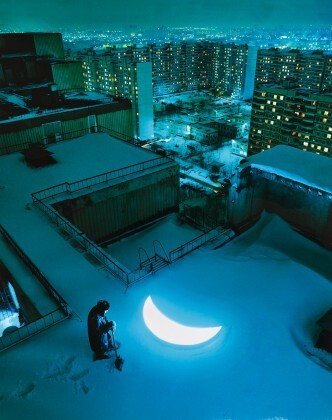 In this photograph, I am standing on the snow-covered rooftop of my studio in Moscow together with the object “Private Moon.” I am there alone with the moon, while people go on living in all the houses around. And they, just like me, are not indifferent to the fate of our planet Earth. Therefore, I decided to join the voices of intelligent people all over the world and demand to end the persecution of Greenpeace activists who acted in defense of the Arctic. The Prirazlomnaya oil platform in the Barents Sea is owned by Gazprom. When an oil spill happens, a great misfortune will befall upon the Arctic’s fragile environment, and ultimately this affects every person on Earth. Without my knowledge, the series “Private Moon” was sold from a private collection to the Gazprombank collection. While the bank has the right to own these works, it cannot display them publicly or use reproductions without my permission. Therefore, I am writing to you as the director of the Albertina Museum to ask you to remove my works from the “Dreaming Russia” exhibition in sign of protest against the persecution of the Greenpeace crew on the Arctic Sunrise vessel and against Gazprom’s oil drilling in the Arctic. A team of Greenpeace International activists abandoned an occupation of Gazprom’s Prirazlomnaya oil platform after complaining of being bombarded by ice-cold water and metal objects. Six activists, including Greenpeace International executive director Kumi Naidoo, scaled the side of the giant platform in the Pechora Sea in a speedboat-born raid early Friday morning. The group used a giant slingshot to pass a string, then rope over a foothold on the platform before using climbing equipment to ascend to a position halfway up the platform’s side, a video of the action posted on YouTube showed. The activists said they had brought enough food and clothes to last for “days,” but by 9 p.m. the activists decided to withdraw. “Not just hosed water, but now metal being thrown by Gazprom crew at our activists; we’re coming down,” Naidoo’s Twitter feed announced Friday evening. Greenpeace said Sunday that “multiple pieces of sharp, rusted jagged pieces of metal were thrown at the activists from above,” as well as a single “large heavy metal object” on a mooring rope that was directed at one of the groups of climbers. Greenpeace said it had recovered several of the metal fragments as evidence. But that later changed. “Intercepted radio from platform: Strict orders to leave us alone ’til tomorrow, but make life as uncomfortable as possible, i.e. lots of water,” Naidoo tweeted from his position next to the platform. Gazprom Neft Shelf, which operates the platform, insisted that the Greenpeace action had not halted work on the platform, which is still undergoing preparations to begin drilling. “Later in the day, after the waterbombing, when some of our activists were experiencing symptoms of hyperthermia, they said we could come up and they would be detained overnight until the authorities arrived. However, the workers on the platform have no authority to detain our activists, and given the situation, with the intense waterbombing and metal shrapnel being thrown at them from the deck above, our activists did not feel safe going on the platform without the Coast Guard or other authorities present,” Naidoo said by telephone from the Arctic Sunrise on Sunday night. The company would not comment on the activists’ claims of having been bombarded by metal objects and fire hoses. The Arctic Sunrise, the vessel from which the raid was launched, remained in the vicinity of the rig and was “monitoring what Gazprom is doing” as of Sunday night, Greenpeace said. 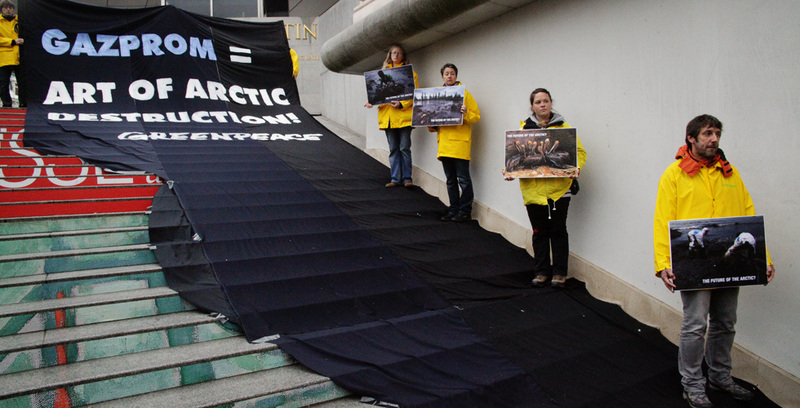 The organization would not comment on future plans other than to say that its fight to save the Arctic would continue.